I’m Todd Messinger, and alongside my parter Peta we are Captain Electric. We proudly operate a local, family-owned business based on quality practices and traditional values, with all the benefits of contemporary electrical knowledge and expertise. 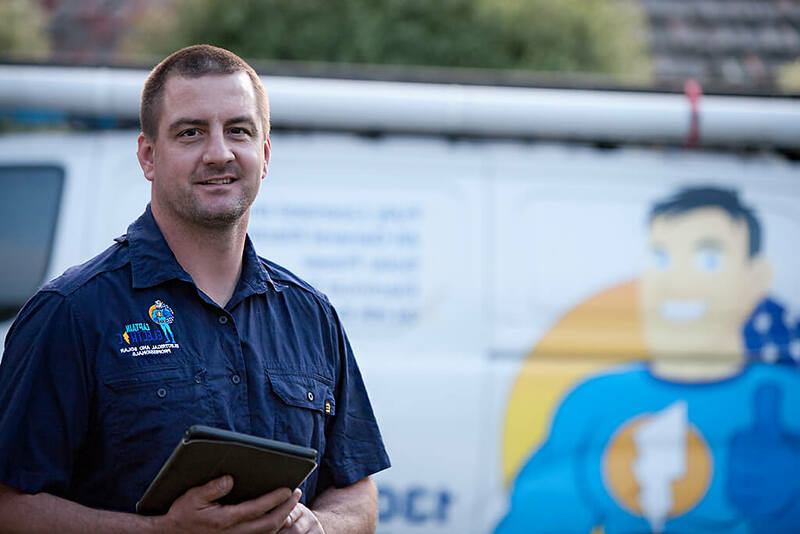 Captain Electric is an independent, Croydon-based electrical contracting business, happily providing round-the-clock emergency service both locally and throughout Melbourne. So why not let us fix that electrical emergency, upgrade dodgy electrics or fire up that stalled renovation? We understand that today’s customers demand more of their tradies than basic service, left-behind mess and bum-crack. So let’s forget the bad old days. We prize punctuality, honesty, respect, cleanliness and super-safety in every job we do. Muddy boots, ladder marks and plaster dust just don’t make the grade –and that’s guaranteed. Think about it. What’s special about superheroes? They exceed expectations every time. With referrals making up a whopping 80% of our work, we’re hitting the mark. We can’t offer superhuman powers. But our team prides itself on going above and beyond, doing that bit extra to ensure you’re super-happy with every aspect of our service. If you’re happy, we are too. Everything home-electrical that could possibly go wrong or need installing -power boards, safety switches, home and garden lighting, rewiring, smoke alarms and air-conditioning to name but a few. All your office, factory, shop and car-parking electrical needs are catered for. We’re a one-stop shop for lighting retailers too. We’re Clean Energy Council Accredited solar designers and installers, committed to providing green, alternative energy solutions for our customers. We offer comprehensive electrical cover for all your new developments. Doing your own thing? Let us offer expert sparky advice and service to help ensure you get a fantastic result. Employ Captain Electric to meet the complete 24/7 electrical needs of your landlords and tenants.